Why do so Many New York Residents Buy Homes in Our 55 and Over Communities? Blair Group is an award-winning developer of 55 and over communities and an organization that has long been successful at making the active Florida lifestyle affordable for older adults. It should come as no surprise, then, that many of our residents hail from New York State. Our communities offer much-needed respite from snow and frigid weather, and are characterized by a spirit of camaraderie that revolves around staying active, having fun, and engaging in neighborly interaction. Cypress Lakes – The main draw of this community in Lakeland is the fact that it offers 36 holes of championship golf replete with well-maintained grounds and a fully stocked pro shop and modern practice facility. Cypress Lakes also has an impressive clubhouse complex where you will find a fitness center, bar and restaurant, swimming facilities, and more. Bear Creek – Nestled in the woods in the community of Ormond Beach, Bear Creek is a veritable Florida paradise. It has three clubhouses, multiple swimming pools, scenic wooded nature trails, and a golf course open to the public right next door. Plus, Bear Creek is just a short drive from the impressive Atlantic Ocean beaches. Lake Griffin Harbor – This 55+ community in Leesburg is located on the southern shore of a nearly 10,000-acre lake, the beautiful Lake Griffin. Residents of this community enjoy lakefront accommodations along with a seemingly endless number of indoor and outdoor activities, from boating and fishing to playing bingo and whiling away hours at the pool. Hyde Park – The 55+ community of Hyde Park near Orlando offers a quiet residential setting that is nonetheless extremely close to all of the sights, attractions, and conveniences of the state’s most populous inland city. It has a well-appointed clubhouse, outdoor pool, and more. 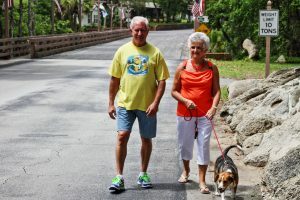 StrawBerry Ridge – What’s not to like about this 55+ community in Valrico, just outside of Tampa? StrawBerry Ridge has two excellent clubhouses, a busy activities calendar, and many conveniences nearby, such as retail stores, health care facilities, and opportunities for employment or volunteering. The best way for New York residents – as well as those from elsewhere in the United States and Canada – to determine whether the Blair Group lifestyle is right for them is to go on a community tour. We invite you to contact our Lifestyle Team today to discuss which community or communities you think you’d like to tour and when. We also encourage you to peruse our updated listings of affordably priced manufactured homes for sale by clicking here.